For more than 2 weeks now I am trying to install the JA_Blazes template (Joomla 3.x) using the quickstart file. The problem is always the same: The installation procedure does not finish, it always returns to step 3. I have read a lot of articles about the problem but no suggestion helped. Any idea? Have you checked your ajax response ? May i know your PHP version. Our quickstart is based on Joomla! 3.1 that would have errors with PHP 5.4 and higher. You can turn off PHP display_errors to bypass it if needed. It should be some error with your ajax. Have you tried to check that ? Or please provide your site CPanel access. I’ll help you work on it. 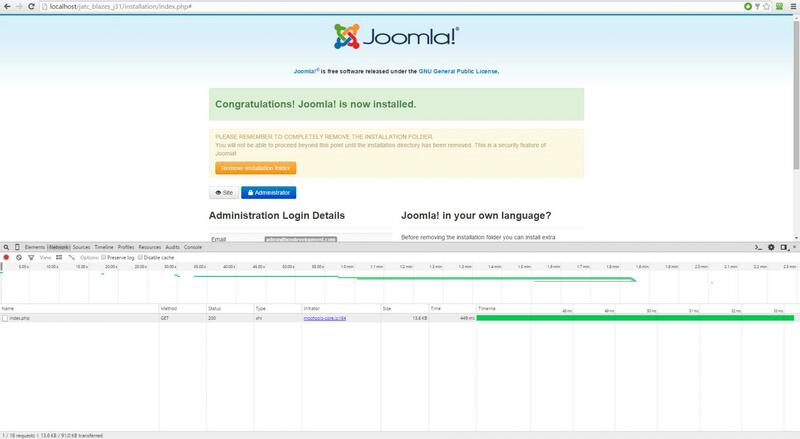 I would also like to ask if you have tried installing the standard Joomla 3 package? By this I mean going to joomla.org and downloading Joomla 3.x then installing that? I am aware directnic have a one click Joomla install from the back end but it is my understanding it is heavily modified to fit their hosting. If you can install Joomla 3 using the method outlined above then it may be easier to create an akeeba backup of the quickstart and send you that to install as it may get around some of your hosting limitations. Step 2: When trying to run the quickstart file on a local machine (with Xampp), the quickstart installation process already hangs on the first (configuration) step. So, business as usual: Once again no quick start. What I expected was: I download/upload the quickstart file, create the database, execute the install procedure and begin placing the content. But this seems to be an impossible mission. Question: Is this template only for Harvard degree holders? I have just tested the quickstart on my own local WAMP install and am suffering similar problems. It seems there is an issues which I will pass back to the devs to see if they can re-create the quickstart. HERE the test site . — It’s based on Joomla! 3.1 . It’s one of older version and already EOL. # I have tried to access your CPanel but your information is not valid. Please help me check it at your side. After got access. I’ll help you install this quickstart. This topic contains 32 replies, has 4 voices, and was last updated by teutobahiano 3 years, 10 months ago.